If you are looking for a quick and easy side dish to go with dinner, buttered noodles are perfect for you. The truth is if you want to know how to make butter noodles, the process is not very hard at all. Fettuccine is cooked and then tossed with butter, parmesan cheese, and pepper. I like to top the buttered noodles with fresh parsley. You can certainly use other types of pasta such as linguini or spaghetti or whatever you have on hand. Enjoy. Fill a large pot with lightly salted water and bring to a rolling boil. 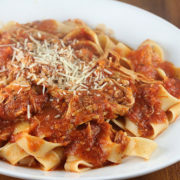 Stir in the fettuccine, return to a boil and cook the pasta over medium heat until tender yet firm to the bite, about 8 to 10 minutes. Stir occasionally while cooking. Drain and return pasta to the pot. Mix butter, parmesan cheese, salt and pepper into the pasta until evenly combined. One of my favorite foods, spanning from my childhood to NOW!